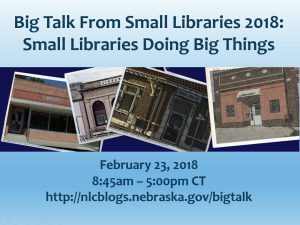 Join us tomorrow for the Big Talk From Small Libraries 2018 online conference. Registration is still open, so head over to the Registration page and sign up! And, Nebraska library staff can earn 1 hour of CE Credit for each hour of the conference you attend! A special Big Talk From Small Libraries CE Report form has been made available for you to submit your C.E. credits. This entry was posted in Books & Reading, Education & Training, Information Resources, Library Management, Programming, Public Relations, Technology, Youth Services. Bookmark the permalink.